All right, everyone, turn to Chapter 11 in The Book of Mormon wherein it is written “Behold, I speak unto you as if ye were present.” Oh, wait. Hasn’t Chapter 11 something to do with bankruptcy? That can’t be right. 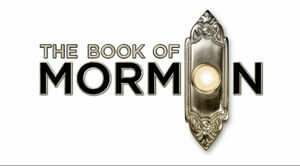 The Book of Mormon is a musical, right? And the people who produced it are in financial heaven. Tony Moronis up the wazoo. Nine of those glittery buggers. What? Ye want to be present again? What the hey? Ye want to laugh yourself silly, brethren? Well, nab some seats and sit your bottoms down at The Orpheum. Warning. Warning. This five-year-old zinger contains “explicit language” and damn straight you better like it or, sure as #z*n, you’ll need earmuffs. Unless those raucous folks next to you are howling so loudly you can’t hear anything anyway. It heads off to darkest, AIDS-infested Uganda where the natives aren’t restless. Rather, they sing and dance their way through famine, warlord oppression, misery, poverty and disease. They mock and mix it up with a couple of lily-whites who’ve just arrived from Salt Lake City, where the hills are alive with sound of praying. The story sends those young Elders to spread the good words of their unquestioning faith, giving Mormonism the texture and nourishment of bubble gum. So, yeah, this is a satire. Life in that part of darkest Africa is not so much nasty, short and brutish as it is more an Oz-like version of a corner of the Third World and a fraction of Utah. The whole thing sort of celebrates innocence, that of the boys, that of the natives. The book, music and lyrics by Trey Parker, Robert Lopez and Matt Stone are right in line with their earlier successes, the show Avenue Q and the animated TV series South Park. Since then, Lopez and his wife Kristen Anderson-Lopez wrote the songs for Disney’s Frozen. The three guys are, at present, spending more time with their families, counting their blessings. The Lopezs, FYI, won an Oscar two years ago for a song from Frozen: “Let It Go,” a Grammy-grabber last year. https://en.wikipedia.org/wiki/Robert_Lopez. Their buddies: https://en.wikipedia.org/wiki/Trey_Parker and https://en.wikipedia.org/wiki/Matt_Stone. Christ almighty has a walk-on, by the way. Deal with it.